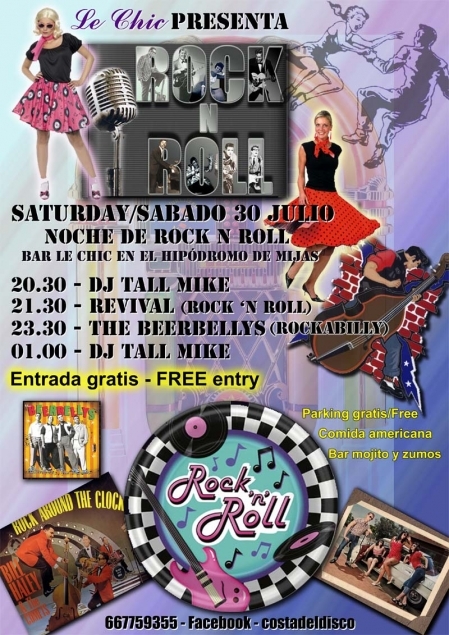 THIS SATURDAY - 30th of July - Hipódromo de Mijas - "NOCHE DE ROCK AND ROLL NIGHT"
A night of Rock n roll and Rockabilly with two live bands and DJ. Revival - playing 50s and 60s R&R - all you favourite songs! DJ Tall Mike - Playing original Vinyl records from the 50s. American Diner serving authentic American burgers, Hot Dogs, Fried Chicken, Chili-con-carne, Brownies and Apple pie. American drinks - Jack Daniels, Budweiser, Coors, Root beer, Dr. Peppers. DRESS - Rockabilly/R&R optional - but more fun!! !